Among the big winners on Town Meeting Day was Liz Gamache, who was elected new mayor of St. Albans. It wasn’t exactly a surprise: Gamache ran unopposed. But given that she was sworn in just hours after the votes were tallied, she didn’t have much time to bask in the glory before getting down to business. 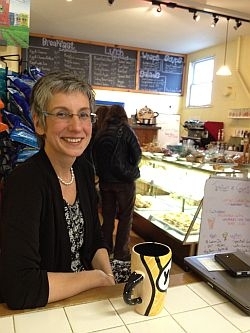 VPR’s Jane Lindholm talked with Mayor Gamache at the busy Cosmic Bakery and Café on Main Street to hear more about her big plans for St. Albans. We look at why Vermont’s eight mayors are speaking out on state-wide issues and what they hope to accomplish, visit artist Eben Markowski’s life-size metal sculptures of wild animals and we read from our mailbag. Doctor Ira Byock argues that we need to seriously shift our political and cultural thinking about end of life care. The Dartmouth-Hitchcock physician is one of the leading thinkers on palliative medicine.